Specially designed for families that wish to experience something truly different, Luxury Action’s Christmas Adventure will introduce you to some unique Arctic activities, and take you on a journey in search of Santa Claus. Over three nights and four days, the itinerary of your journey is carefully matched to your family’s specific needs, and includes a variety of specifically designed activities that celebrate Christmas in authentic Arctic style. From husky sledding, reindeer sleigh rides, snowmobile safaris, and even mini snowmobile adventures for the children, our Christmas Adventure promises you a unique and magical experience that you will remember for years to come. And the highlight of the trip will be the smiles of joy on everyone’s face when you visit Father Christmas himself, in his secret forest hideaway. Your exclusive Christmas Adventure will be tailor-made to include any of the following activities or programs. Furthermore, if there is anything else you’d like to try during your stay, FirstClass.com.au and Luxury Action will be delighted to arrange it for you. Join Luxury Action and Santa to celebrate the warmth, love, and magic of Lapland. Your plane descends towards Rovaniemi Airport, and you get your first glimpse of the winter wonderland where you’ll spend the next few days. As you step off the plane, you catch your first breath of the cold, clean air as you are welcomed by your personal host, who will look after you during your stay. Your first stop will be at our airport-based private lounge to get your winter clothing that will keep you warm and dry the coming days. You’ll emerge into the cold air, wearing our comfortable, Arctic-proofed gear, ready for adventure. When leaving the airport, one of our exclusive cars will whisk you away on a 15-minute drive into the Arctic wilderness, where the warm fire of your Christmas wooden chalet awaits. During your three nights stay, your meals will be prepared by your very own private chef, so you can relax and enjoy the Christmas spirit. While you wait for your dinner to be served, the chef has prepared a gingerbread dough. It’s time to get your children baking, to ensure you have an endless supply of christmas biscuits for the coming days. After a welcome meal, your guide will take you out to introduce you to the region. The children will learn to make snow lanterns and build a snowman to decorate your chalet. We’ll get on the snowshoes and toboggans, that will be available for you to use for the entire duration of your stay. Once we’re comfortable with our Arctic transport, your host will take you out in hunt of the Northern Lights, and show you the best places to spot the phenomenon. During your stay your host will also keep an eye on the Northern Lights activity, and alert you at any time, should our skies be dancing. After tasty breakfast, your guide knocks on the door, ready to take you out for dog sledding. At the husky kennel, you’ll meet the dogs, their excited barks filling the air. You are provided with all the necessary equipment, and taught how to drive a team of dogs. With the children safely wrapped up in warm furs in the sleigh, you set off! As you slide through the snow and into the wilderness, the barking of the dogs subsides, and all you can hear is the pounding of paws and the sound of the sledge on the snow. Standing on the runners, by placing your weight, the dogs turn, and you are entirely in the moment. The white and magical landscape slips by as the dogs pick up speed. Their joy at pulling the sleigh is contagious, and you see broad, happy smiles on everyone’s faces. Afterwards you will have time at the kennel to visit the dogs and their puppies, while your chef is preparing you a forest meal that you will enjoy by a camp fire in a cosy, Lappish ‘kota’ building. Leaving the eager sled dogs behind, we set of for the next adventure: snowmobiling! snowmobile ride is a highlight of any Arctic adventure, and not to be missed. After a brief introduction to safety and the controls of the snowmobiles, it’s time to set off on our state-or-art snowmobiles for your tailor-made excursion into the wild. Through forests and over hills packed with snow, you’ll drive deep into the wilderness where not many have been. You’ll get the chance to let rip across a frozen lake and experience the speed, the freedom and the adrenaline rush that can only be had when these thrilling machines roar over the snow. While a driving licence is needed to operate a snowmobile, children and those without licences get to enjoy being pulled along in a sleigh. Adults and older children can also share a snowmobile with the driver as you ride through the beautiful snowy landscapes. We will also have mini-skidoos available for children, so they can try out driving themselves, while adults can enjoy warms snacks over the campfire. During or after the snowmobile ride there is an opportunity to make a stop to cross the Arctic Circle at Santa Claus Village, where are also various design & hand craft shops and the office of Santa Claus, as well as his official post office. After all day outdoors, you are surely happy to return to your Christmas Chalet where your chef is waiting for you with dinner. You wake up to another snow-white morning and the inviting smell of fresh breakfast prepared by your chef. Your host will pick you up for another day of adventure. Driving through the snowy landscape, surrounded by never ending wilderness, you arrive to the magical home of reindeer. Here’s the reindeer waiting for you to hop on the sleigh. Warmly wrapped and tucked in the sleigh, you start another journey in the forest until you arrive to a hidden hut, smoke coming out of the chimney. Who may live here, hidden away? Did we just see an elf disappearing towards the hut? Let your children discover who is keeping warm in the hut, perhaps you are invited in for a story of your lifetime? Is it Santa himself, waiting with the presents? The reindeer will pull you through the forest and introduce you to the life of a reindeer. You will arrive to a Lappish kota where the reindeer herder is waiting for you. While you enjoy a delicious lunch cooked by an open fire, you will hear fascinating stories about the life in Lapland that evolves around the reindeer. As you drive back towards your Christmas Chalet, the sun sets, the sky turns gold, but this day will live on forever. In the afternoon you will have time at leisure to enjoy many delights of Lapland. 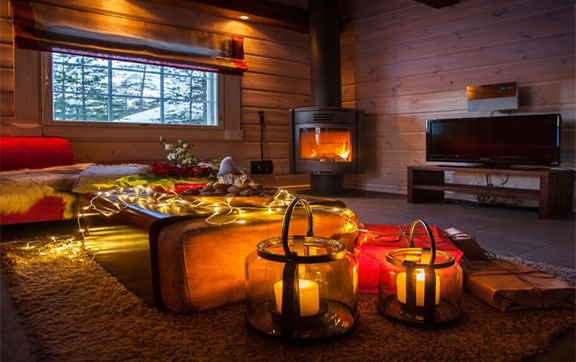 Your host can take you out tobogganing, skiing or for a snow shoe walk in the forest. Or perhaps you wish to visit Arktikum, an interactive science centre where you can learn everything about the life in the Arctic. 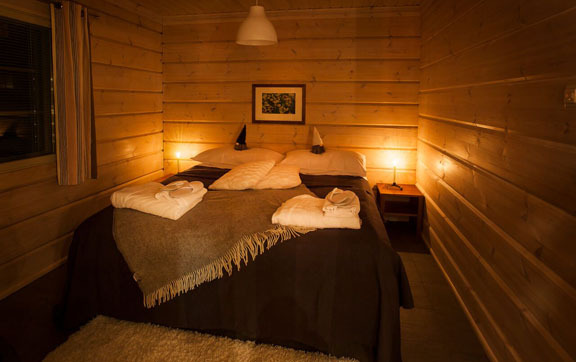 Alternatively you can visit the city centre, local natural attractions or simply enjoy cosy family time in the Christmas Chalet. After the dinner your host will pick you up for another Northern Lights adventure – this time by snowmobiles. Warmly tucked in the sleigh, we’ll drive out in the darkness, away from the light pollution and the city noises. It is so quiet you can hear the silence, as we make a stop in the forest overlooking Northern sky. We’ll make a fire to keep us warm and enjoy some snacks and warm drinks, ready for nature’s own show. The sun hardly rises above the horizon on your final day in Lapland – but the fresh Arctic air and the bountiful memories from your trip will put a smile on your face. After your breakfast, it’s time to check out and your host is waiting to take you for your last adventure before your departure. Today we will visit an exclusive handcraft workshop in true Lappish settings. As you step inside the cosy red cottage, you’ll be welcomed by one of the region’s best handicraft artisans. After introducing you to some of the materials and methods she uses to make her delightful souvenirs, you’ll get a chance to make your own. Using the shed reindeer horns that can be found lying in the Lapland wilderness, you’ll learn how to craft your own unique horn souvenir to take home with you, so you can impress your friends with your newly acquired skills. As you work on your masterpiece, you might notice a delicious aroma wafting through the house. Your host is also an excellent cook, and likes to share her delicacies with a warm drink and a story from Lapland. The Handicraft Workshop is a unique opportunity to get a real taste of life in Lapland, and a chance to take something special home. After your hands on Lapland experience and a delicious lunch, your transfer is waiting, ready to take you to the airport. If your departure time allows, we’ll create yet another adventure for the day, as we will be at your disposal until your plane leaves and it’s time to say goodbye to your host. It’s been a pleasure having you here, and while it’s always sad to see people leave, we’re sure one day you’ll return again! Finland has won many international accolades and regarded as one of the safest, greenest and liveable countries in the world with happy people and sustainable way of living. Yet the country is one of the Nordic’s best-kept secrets. Our stop-over add-on will get acquainted with Finland’s capital city Helsinki on your way to Lapland. Helsinki is a sweet capital with unique offering. There’s a prison turned ginto a hotel, a rock carved into a church, the sea surrounded by the city freezes solid in the winters, and within minutes from the centre you are whisked into alluring archipelago or to the wild national park. On you arrival your driver will meet and greet you, and drive you through the capital’s most interesting districts, and introduce you to the highlights of the city according to your personal interests. For the evening we have reserved a table at one of the capital’s awarded restaurants depending on your taste; perhaps we’ll let your taste buds to meet east and west in one bite? Your final destination for the night will be the first five star hotel in Finland, Kämp. This historical hotel is worth traveling to Helsinki all on its own, but the location in the heart of the city, across the Esplanade Park and in the middle of the finest shopping area in town, makes the hotel ideal spot to explore the Nordic capital even in a short period of time. *Rates above are person based on twin share. Single Supplements apply, for more information please speak to one of our Travel Specialists. Please Note: Accommodation has strictly limited availability so book quickly to ensure your place. The total cost is for 2 adults and 2 children sharing a 2-bedroom chalet. Prices for smaller parties, additional people, longer stays or add-ons on request. Rates based on your departure date. Examples of additional experiences available on request: a night in a glass igloo or a snow hotel, dinner in an ice restaurant, visit to a Christmas theme park, ice driving or ice karting, true Finnish sauna experience by a forest lake, visit to Arctic wildlife park. 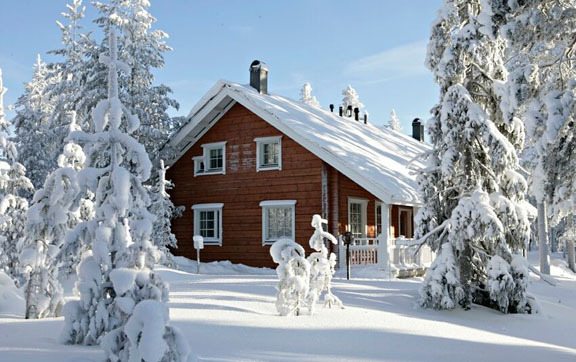 Year-round Christmassy accommodation situated near the top of Ounasvaara fell, just a mere five minutes drive from Rovaniemi city centre or 10km from Rovaniemi Airport and Arctic Circle. and snowboarding is possible at the ski centre within walking distance from your Christmas Chalet. The Christmas Chalets will be decorated to celebrate authentic Finnish Christmas spirit, including real Christmas trees. You will have an own entrance directly outdoors, a private porch and a fire place with fire wood always available. Each well-equipped 67m² (721 ft², 80 yd²) apartment comes with 1 double room, 1 twin room and a loft with 2 additional beds, fully equipped kitchen, living room, and sauna. There are two bathrooms with toilet; one downstairs and one upstairs. TV, Radio with CD player, Sony Play Station 2 and fast Internet access will be at your disposal. Set 200 miles into the Arctic Circle, Pure McLaren Arctic Experience offers a thrilling and exclusive experience.